My niece (really my husband's step-brother's daughter but who's counting?) turned two recently. She's the baby I watched two summers ago. 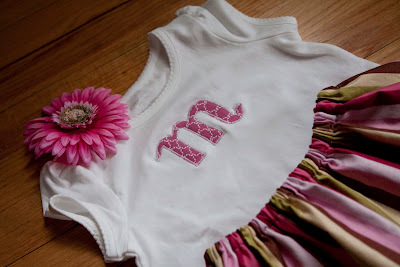 Maddie needed a fresh, springy outfit to celebrate two-ness! 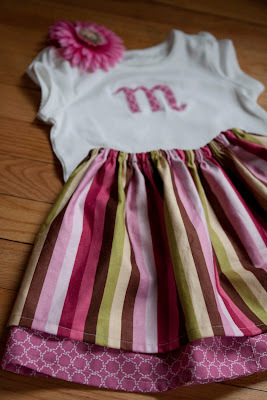 The fabrics are both from Joanns and the t-shirt is from Target. I love Target. The flower happened to match the outfit she was wearing! If you would like to win one of the flower hair clips like Maddie is wearing (it is slightly lighter pink), leave a comment. I'll pick a winner sometime on Sunday via some kind of randomness (I tend to like to give a human the number of entries and have them pick a number). I will send it out early next week! By the way, it looks cute in adult hair as well! I would love to be entered! Thank you! I love the outfit! The skirt is adorable and I am a fan of Target also. 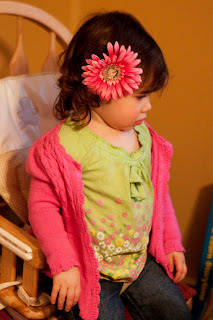 I would love to win the flower clip for my daughter Lizzy(6)! Thanks for the opportunity!